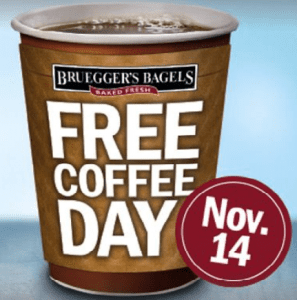 Free Coffee from Xtra Mart, Bruegger’s Bagels & Cumberland Farms! On Wednesday, November 14, 2012, Bruegger’s Bagels is hosting a Free Coffee Day until 2pm! No coupon is needed, but guests are encouraged to donate a little something to the Children’s Miracle Network Hospitals. Oh boy, it is going to be a highly caffeinated (and hopefully productive) week!